Seller will ship item if needed. 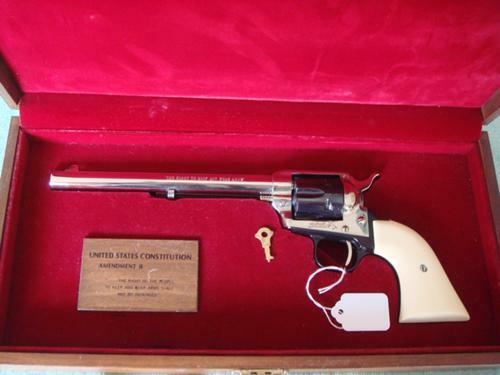 Colt Single Action Army Peacemaker 22; 22LR, 7 1/2-inch barrel. It is finished in bright nickel with royal blue cylinder and grip frame; it wears simulated ivory grips. Cylinder shows a turn ring; has been fired by a previous owner. Despite this the gun appears new. Comes in a lockable presentation case with key. Nickel is bright and shiny; blue is dark and lustrous. Gun and presentation case are in excellent condition.